Burnley boss Sean Dyche admits that he’s full of admiration for the job that ‘Manager of the Decade’ Eddie Howe has done during his time at AFC Bournemouth. The Turf Moor chief’s predecessor, who claimed the accolade at the Football League awards last year, has guided the Cherries from League Two to the Premier League in two separate spells on the South Coast that sandwiched his tenure with the Clarets. The former defender, who boasted a 33.1% win ratio from the 84 games he took charge of with the Clarets, before exiting in the aftermath of a 4-3 defeat to Crystal Palace at Selhurst Park in October 2012, makes his return tomorrow. “He’s done really well,” said Dyche. “They’ve had good backing there financially but that aside you’ve still got to get the job done and he’s done a really good job without a shadow of a doubt. But while Dyche passed comment on Howe’s journey at the Vitality Stadium, he insisted that the most important matter at hand was to ensure that the Clarets continue their own fruitful voyage on home soil. Burnley have beaten Liverpool, Watford, Everton and Crystal Palace at home and were unfortunate to miss out on the points against Arsenal and Manchester City. Now Dyche is urging his players to take that same mentality in to tomorrow’s fixture. He said: “We’ve changed things away to try and get an affect there but at home there has been a good balance of how we’ve gone about it. “Arguably, we could’ve probably nicked another couple of points if decisions had’ve gone our way. Our home form has been strong, that’s fair to say, but we’ve got to continue that. Dyche added: “You have to be tactically organised and you have to know what you’re doing. The thing that glues it all together is that firm mentality to go and deliver a performance. 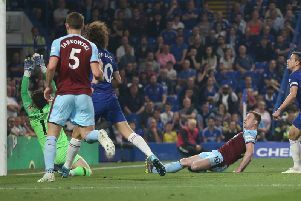 Meanwhile, Dyche confirmed that winger Johann Berg Gudmundsson remains a doubt for tomorrow’s clash while skipper Tom Heaton will face a late fitness test.